Tours are conducted by a professional guide. • HAGIA SOPHIA is a former Orthodox patriarchal basilica (church), later a mosque, and now a museum in Istanbul, Turkey. In 1453, Constantinople was conquered by the Ottoman Turks under Sultan Mehmed II, who ordered this main church of the Orthodox Christianity converted into a mosque. By this point, the Church had fallen into a state of disrepair. Nevertheless, the Christian cathedral made a strong impression on the new Ottoman rulers and they decided to convert it into a mosque. The bells, altar, iconostasis, and sacrificial vessels and other relics were removed and the mosaics depicting Jesus, his Mother Mary, Christian saints and angels were also removed or plastered over. Islamic features – such as the mihrab, minbar, and four minarets – were added. It remained a mosque until 1931 when it was closed to the public for four years. It was re-opened in 1935 as a museum by the Republic of Turkey. • THE HIPPODROME OF CONSTANTINOPLE – was a circus that was the sporting and social centre of Constantinople, capital of the Byzantine Empire. Today it is a square named Sultanahmet Meydanı (Sultan Ahmet Square) in the Turkish city of Istanbul, with a few fragments of the original structure surviving. 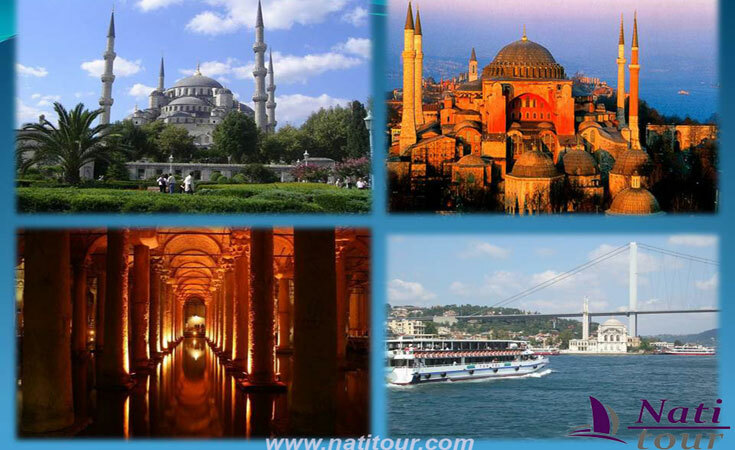 • THE SULTAN AHMED MOSQUE- is an historic mosque in Istanbul. The mosque is popularly known as the Blue Mosque for the blue tiles adorning the walls of its interior.It was built from 1609 to 1616, during the rule of Ahmed I. Its Külliye contains a tomb of the founder, a madrasah and a hospice. • THE BOSPHORUS CRUİSE BOAT TRIP-the magnıfıcent shores of Bosphorus. • THE WALLS OF CONSTANTINOPLE- are a series of defensive stone walls that have surrounded and protected the city of Constantinople (today Istanbul in Turkey) since its founding as the new capital of the Byzantine Empire by Constantine the Great. With numerous additions and modifications during their history, they were the last great fortification system of antiquity, and one of the most complex and elaborate systems ever.